The Golden Dustpan is a highly prized monthly award given by student council representatives to the grade that keeps their designated area of campus clean each week. The PTSA Membership Drive and Annual Appeal is in full swing and Robinson needs your support. We currently have an overall 67% PTSA membership. Please help us achieve our goal of 100% PTSA membership participation. Each class that reaches 100% PTSA membership participation receives a class-wide popsicle party. Click on "Read Full Story" below to check out your class standings. Please take 5 seconds to sign up for the Robinson Weekly Wave. What are the 4 Bs?? 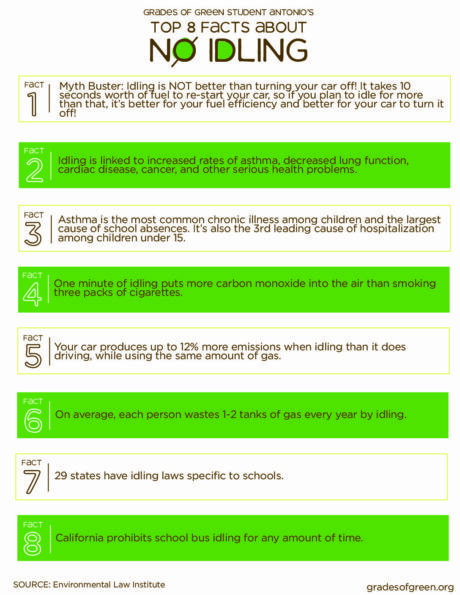 See the Top 8 No Car Idling Facts here!